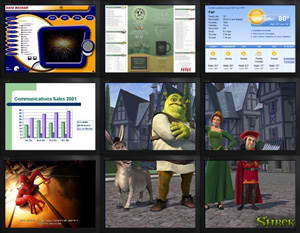 visioNext has a range of products for videowall systems. One manufacturer, SmartAVI, specializes in video wall and data wall technologies. The extensive product range provides solutions for a wide and varied range of applications including: Video Wall and Data Wall controller hardware. Financial dealers and traders need masses of timely and accurate information at their fingertips at all times. Command and Control Applications Multi-screen systems play a crucial part in the command and control centers. Two, four or more screens, each with live video overlay can be installed in one machine to give access to a wide source of rapidly changing data. Video Conferencing Video Conferencing is an ideal application for multi-screen cards with live video overlay capabilities. View the video feedback and use the other screen for related applications under discussion. Medical Imaging Medical Imaging is becoming one of the primary markets for multi-screen solutions with PCs providing the display technologies, since computers are used to analyze, manipulate, communicate and store images. Imaging engineers use applications that require the large display area of multiple monitors to access images and data. This feature is particularly useful for display walls using LCD panels, allowing each panel of a 2 x 2 wall to be mounted in a different orientation. Many LCD panels have larger borders on two of the panel edges, by changing the orientation the minimum gap between displays can be achieved. 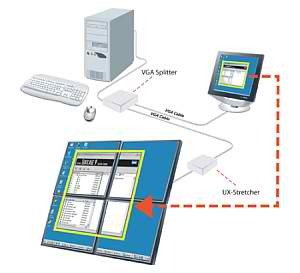 2 x 2 VGA Display Wall Controller. The UXST4 accepts analog or DVI VGA video input. The UXST4 supports both analog and DVI displays. A stand alone unit that requires no software or other hardware to be installed on your machine. Multiple units can be used for larger wall configurations.